As Senator Kinsey is greeting well-wishers, he is shot by an assassin's bullet. News of his death comes as a surprise to O'Neill when he returns from a fishing vacation, but when a surveillance videotape places O'Neill at the scene, he is unable to prove his alibi. O'Neill is arrested as the prime suspect, and the rest of SG-1 is determined to unravel the mystery and prove his innocence. Carter suggests that duplicating technology, such as the mimic devices retrieved after the foothold incident at the SGC, could be used to frame O'Neill, and she travels to Area 51 to investigate. At Area 51, Carter discovers that the alien mimic devices have been stolen, and she turns next to the NID in Washington, DC. There she meets with Agent Barrett, who explains that he has been assigned to expose rogue agents within the NID and that Kinsey had been cooperating with the investigation when he was shot. Meanwhile, Jonas and Teal'c trace Dr. Langham, a scientist who had access to the mimic technology, and who reveals under interrogation that rogue NID agents have been working with a shadow organization of powerful businessmen known as the Committee, in order to use alien technology for commercial profit. Carter and Barrett track the murder weapon and discover a set of fingerprints which point to an NID agent named Devlin, and Barrett also reveals that Kinsey is alive and in a coma. Devlin, using a mimic device to appear as Major Davis, infiltrates hospital security and makes a second attempt on Kinsey's life. When Devlin later appears before the Committee, he morphs into Carter, who had apprehended Devlin and used a mimic device to conceal her identity and obtain a confession. The Committee is brought down, and O'Neill's name cleared, as a recovered Kinsey greets the press, and takes credit for the entire operation. The shadow organization within the NID calls itself the Committee. The Committee is made up of five businessmen who operate outside the law. They buy alien technology intending to make billions on their investment by incorporating alien advancements into their product lines. In the last six months there have been at least 10 new patents, including industrial chemicals, metallurgy, and computers, that can be traced back directly to Area 51. Rogue NID agents answer to the Committee. After the Prometheus incident, Agent Barrett was given orders from the White House to expose the Committee. He blackmailed Kinsey into cooperating with him, making him a target. The Committee was behind the assassination attempt in order to eliminate both Kinsey and O’Neill. A presidential order had removed all mention of the foothold incident from official records. Twelve mimic devices were recovered for study at Area 51. Dr. Langham was a scientist at Area 51. He stole the 12 mimic devices and engineered his own disappearance, taking the identity of David Zwydel, to provide the technology to the Committee. The original holographic images created by the alien mimic devices seemed to last indefinitely. Those created by the scientists at Area 51 were only sustainable for 3 to 4 minutes at a time due to problems with electromagnetic interference. Carter’s device lasted six and a half minutes, a new record. O’Neill was alone on vacation in Minnesota, fishing, 20 miles from the nearest town. 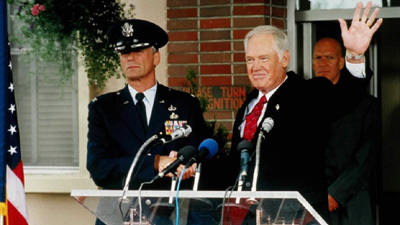 O’Neill was held at Peterson Air Force Base after his arrest, awaiting transfer to Washington. The murder weapon used by Devlin was a Remington 700 with a customized breakdown stock. Major Davis acted as liaison between the Pentagon and the District Attorney in the murder case against O’Neill. Carter and Agent Barrett met at Stanton Park in Washington, DC at 3pm. Carter can pick locks and carries her own lock pick tools. Devlin’s house number is 1605. Langham was detained in a holding cell on level 16. Teal’c was taught how to drive by Daniel Jackson, in 1969.